Walker (Christ Church) Churchyard contains 21 First World War burials and 25 from the Second World War. The cemetery also contains three Serbian graves of 1918. One soldier who served with the Yorkshire Regiment is buried in this cemetery. Select the image above for a larger one which opens in a new window. 6th Battalion Yorkshire Regiment. 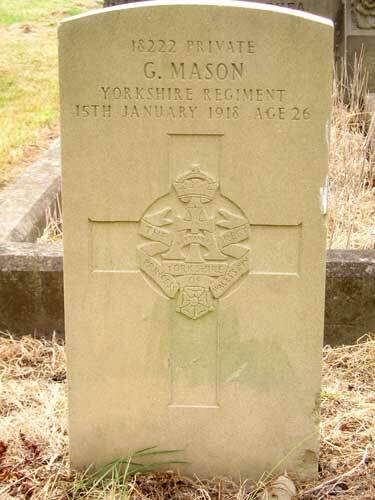 Son of George and Margaret Jane Mason, of 73, Mitchell Street., Walker. Died at home 15 January 1918. Aged 26. He enlisted in the Yorkshire Regiment (3rd Battalion?) on 8 December 1914 in Sunderland. He was posted to West Hartlepool and served at home until 14 September 1915 when he joined the 6th Battalion in Gallipoli. He then served with the 6th Battalion in France. In September 1916 he was wounded (GSW back). He was discharged as being no longer medically fit on 27 July 1917. Photo by Bob Graham of the 2nd Battalion Newcastle Branch of the Green Howards Association. (bob.g48@btinternet.com).